A hot tub which you can use anywhere, heated up with natural wood fire and treated to last you a lifetime, is a treat which you need to experience at least once. Whether you install it near your home, setting it up in an area where you don’t have access to regular plumbing or take it with you in long camping trips, you’re in for a treat. No one should think about this type of tub as a substitute for a ‘normal’ tub. It’s in fact the much better version, taking the simple ritual of bathing closer to nature and fire, the pure heating element. Everyone should indulge in this pleasure if they can, so take a look at our list of the best wood fired hot tubs and pick your favorite. A beautiful blue glaze coats the inside of this stunning wood fired hot tub, inviting you to dive in at your earliest. Once you climb in, the molded vinyl seat will provide an incomparable relaxation feeling. Truly, out of all the best wood fired hot tubs on the market, this is our top pick. Of course, it’s not just about the comfort and feel of the tub or about its relaxing and beautiful coloring. All the materials used in the making of this fire heated hot tub are pro-level, ensuring maximum durability and performance. The frame is also wooden, made from the finest slow grown Nordic spruce, carefully selected, thermally treated, polished and oiled to last you a lifetime. The interior of the tub itself is made from aluminum coated with a high-quality vinyl designed for both resistance and comfort. Its surface is also naturally bacteria repellant, which will somewhat slow the usual growth of bacteria film that you can expect in a hot tub. It will still need proper cleaning and maintenance (more on that below) but your health is better protected on the long run. An elegant reddish-brown natural cedar adorns this beautiful wood heated hot tub. This is the biggest of all our best wood fired hot tubs, large enough to accommodate 5 people with plenty of room for each. If you have a large family and need generous space in your hot tub, this is the one to look at. The 60’’ diameter makes sure everyone will feel comfortable and the two-step ladder helps them climb in. All the accessories for the hot tub are included in the deal and come with a 1-year warranty period as well. Considering that this is one of the best fire heated hot tubs on the market and that everything comes as a bundle bargain, it’s one of the safest bets. We know this is an important decision and you can’t simply decide on one of the above randomly, based on whim. To make it easier for you, we’ve broken down all the characteristics you should pay attention at when browsing the best wood fired hot tubs. Hot tub heaters can be quite different. Each type has its own pros and cons, so make sure you weigh it all out before reaching the best decision for you. Placing the stove (or heater) outside the hot tub translates into an immediate advantage: more actual space in the tub. If you like sharing your hot tub with the entire family or simple enjoy more room to yourself, this is a clear thumbs up. On the other hand, bear in mind that more space will also mean more water to heat and therefore more wood and time required. An internal heater eats up a bit of the space inside your wood stove hot tub, but has the advantage of retaining heat a bit better. Since the stove is submerged in the very water you’re using for bathing, the loss of heat over time is minimal. Normally, the best wood fired hot tubs should last up to a lifetime if you care for them properly and as intended. Technically, the hot tub life expectancy you can hope for is around 2 or 3 decades. After this period of time, even if the fire heated hot tub is still usable, the layer of bacteria alone makes it a better candidate for recycling. If you’re concerned about reaching that far, opt for a product with a longer warranty period (5 years). 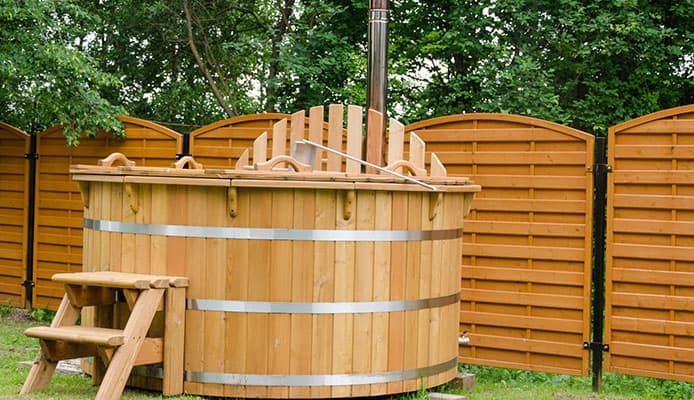 For the sake of looks, the best wood fired hot tubs are contained in a wooden frame, but one which has been thermally treated not to get damaged. The inner parts are made of metal and an isolating layer, like more wood, vinyl or ceramics. Look for extra durable materials for the parts and hardwood for the wooden layers, in order to get the most highly performant materials. A hot tub is more fun when shared with others, right? Depending on the size of your family or the parties you entertain, only you know how many people you need to accommodate in the tub. Usually, you can expect their sizes to range from 2 to 5 people as intended use. 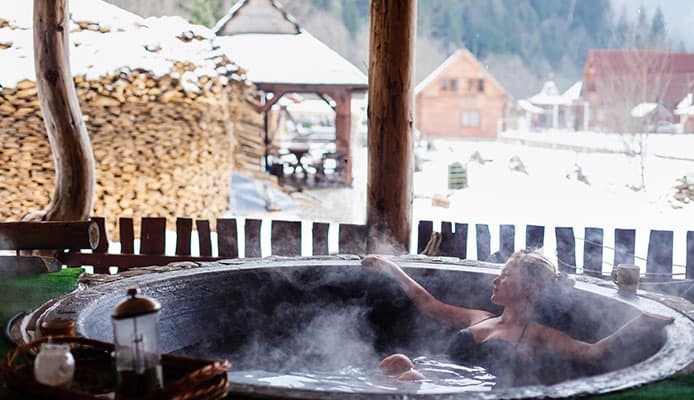 A matter of personal preference, the style of wood fired hot tubs is usually centered around Nordic esthetics, since that’s where SPAs, saunas and hot tubs originated. You can expect a lot of wood in the looks and details, and beyond that, it’s all up to what you prefer. Weight is not very consequential for a fire heated hot tub, since in order to make it portable it’s more important for it to be easily assembled and disassembled into parts. As long as you have a reliable off-road vehicle, you’ll be able to load and carry it around. Still, if your car has some weight restrictions it’s best to ask the seller directly, in case the weight is not specified in the product description. Depending on the size of the tub, you may find yourself burning through 20-100 liters of dry wood for every bath use. It can actually vary that greatly, yes. Of course, the best wood fired hot tubs are designed to be economical and to be able to maintain heat effectively once the proper temperature is attained. Still, for a larger hot tub, a larger quantity of wood will be needed. Remember to take this expense into account when you decide on the best wood heated hot tub for you. Q: What Are The Advantages Of Wood Fired Hot Tub? A: There are plenty of advantages to using a traditional wood burning hot tub. Some of them are for the sake of the environment, and some are for your own sake. Let’s start with the first category. 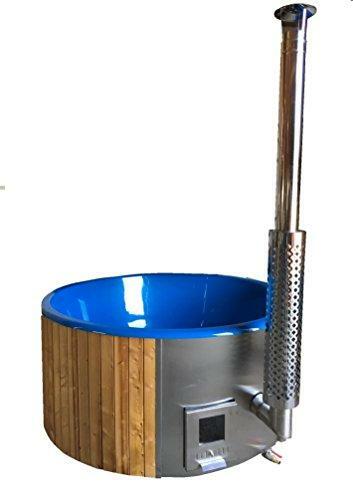 All wood burner hot tubs are amazingly eco-friendly compared to regular indoor tubs. First of all, they don’t need any electricity to run, and most manufacturers of fire hot tubs put great care into selecting only green materials to go into the product. Secondly, the wood these tubs need to burn for fueling and heating up has no negative impact on the environment. Also, if you’re wondering whether burning wood releases any extra carbon dioxide, don’t worry. Burning it releases about as much of this substance as it would release by simply rotting away. Therefore, you really don’t need to worry about your carbon footprint. Now, let’s take a look at the benefits of using a top rated wood heated hot tub for yourself. First of all, everyone who’s tried one can vouch for the superior experience they provide. The quality of the heat and the sensation of actually bathing in such a tub can’t compare to what you’re used to from regular tubs. Take a look at all wood fired hot tub reviews and you’ll see: the pleasure of taking a bath in a fire heated bath is worth the effort. Second of all, it’s not only about the experience. There are proven hot tub health benefits to consider, too. Pain relief, better flexibility, improved quality of sleep and regulating your blood pressure are just a few of the good things you can expect. Some people even swear by losing weight as an intended benefit of using a fire heated hot tub! Q: How To Clean And Maintain A Wood Fired Hot Tub? 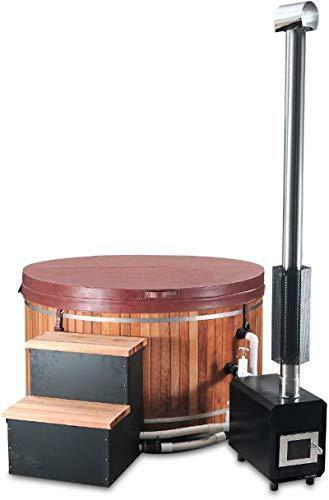 A: While you can afford to give your new wood fired hot tub a quick and careless wipe-clean every now and then, especially when away, you should know that you need a better clean and care routine on the long run. Even the best wood fired hot tubs (and all other hot tubs in general) can become damaged if not cleaned and maintained properly. First of all, invest in a proper cleaning product, designed especially for this type of tub. There are plenty of professional hot tub cleaners on the market, so go grab yourself a couple of bottles and keep them on hand. Proper cleaning will not only prolong the life of your tub, but also keep away the bacteria which are potentially harmful for your health. Second of all, there’s a bit more to hot tub and SPA maintenance than just using a good cleaning product. For the best long-term results, you should consider using some chemicals in the water, in order to keep gunk and invisible bacteria layers from accumulating. Some experts say you should use enzymes in your hot tub, others say you should convert to a salt water hot tub. Most simply swear by using a bit of chlorine in the water or as part of the cleaning ritual. To keep a better grip on things, you should also use a calendar for your hot tub maintenance. This way you can remember what cleaning routine to perform and how often. Every week you should give your hot tub a shallow cleaning and a deep shock cleaning once a month. Also remember to keep your hot tub covered properly when not in use. There are plenty of hot tub covers on the market to choose from if you can’t get one directly from the same manufacturer as your hot tub. Q: Which Wood Should I Use? A: The easiest choice is to stick to pre-packaged wood fuel which you can buy from most outdoor stores or order online. Such fuel comes either as bricks or wood pellets, and both of these are simple to use for heating up fire hot tubs. As for the exact type of wood, a classic and convenient choice is oak, or dry birch for Nordic countries, but you can also find hardwood pellets for a more lasting heat level. We more than understand the appeal that hot tubs have for many likeminded people. Whether it’s set in the backyard or on the go, few things are as pleasurable as relaxing in one at the end of the day. Some users opt for built-in electrical hot tubs, others prefer inflatable hot tubs, or wood fired hot tubs such as the ones above. Whatever your personal preferences, the best hot tubs are always a preferable alternative to any other bathing option. We hope our guide for choosing the ideal wood burning stove hot tub helped you pick the option that suits you best, and that you also understand more about hot tubs now. When in doubt, feel free to come back to our guide and check out the main features of hot tubs explained. Happy outdoor bathing! Wood Burning Stove Safety, SalemFire.org. Hot Tub Safety Tips, APSP.org. 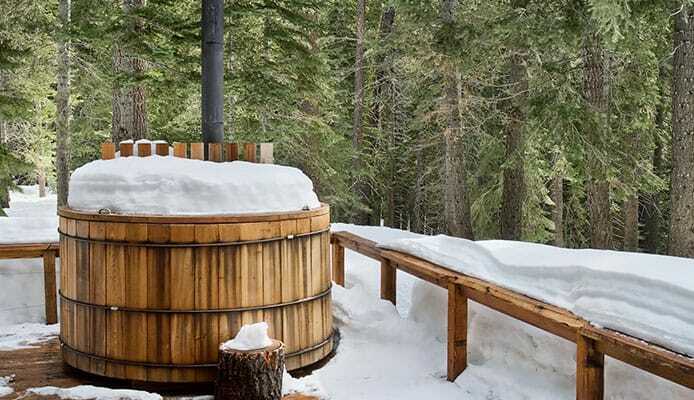 Did you have the pleasure of enjoying a traditional bath in a wood stove hot tub before? Are you craving to try this for the unique experience of blending natural living with modern comforts or are you planning a really long stay in the wild? Are you looking to install a fire heated hot tub as a permanent fixture near your house (perhaps overlooking your garden)? Share your ideas with the Globo Surf community and let us all inspire each other with new adventures!